New York, NY Last week the U.S. Supreme Court ruled that state laws allowing for Medical Marijuana use are unconstitutional. This has sent ripples through the medical community, with many patients and doctors fearing prosecutions. 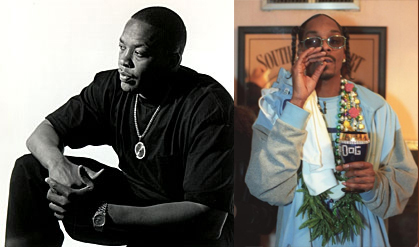 Now the most influential physician/marijuana advocate in the world may also be exposed to the wrath of the law, Dr. Dre. Dre, as he is known on �the streets,� is most famous for his role as a man of beats, but in his spare time he helps to beat pain. Insiders say that the �doctor� began practicing medicine in earnest at the same time that he began to perform in earnest with NWA. In fact they point to Ice Cube�s name as an example of this. �We were on tour and we could not get no weed for some reason� I can�t remember exactly why� but that is not important. Anyway, we could not get weed, but my man was in some real pain. So instead of numbing with herbs, Dr. Dre told him that he should get a large ice cube and rub it on the affected area to numb it locally. That is how he got the name �Ice Cube,�� said the Ghost of Easy E, talking via Generally Awesome Dotcom�s resident psychic, Maria Braccioforte.